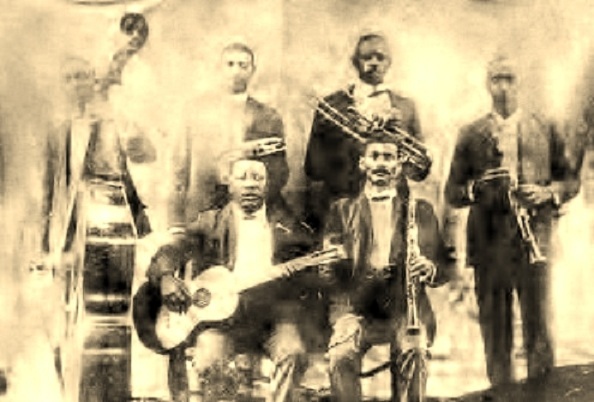 Buddy Bolden: The King of Jazz and his band circa 1905. Much like the crazy rhythms that would go on to become John Coltrane, Charlie Parker and Miles Davis it took an outsized character to get some musicians together and play like they were possessed by something greater than music in the dying days of the 19th century in New Orleans, Louisiana. That character was a native son to the Crescent City and Charles Joseph "Buddy" Bolden was a man possessed. When the New Orleans cornet player formed his first band in 1895, Bolden was the first to blend blues and brass and a livelier beat that begat ragtime, that begat jazz. At the height of his popularity in 1907 Bolden was committed to the Louisiana State Insane Asylum. He was 30 years old. His band would continue on without King Bolden for two more years before splintering off to other bands, other careers and other lives. Buddy Bolden's star would fade within the confines of the Louisiana State Insane Asylum where he died in 1931. The only known surviving song of Buddy Bolden, Buddy Bolden's Blues is acknowledged today as the oldest known jazz tune. The irony is that Buddy Bolden is not even credited with writing Buddy Bolden's Blues. His trombonist, Willie Cornish improvised and extemporaneously created the lyrics on stage one night while performing to a packed house in the rough and tumble New Orleans neighborhood known as the Back o' Town. There were so many bodies in the poorly ventilated Union Sons' Hall that the odor of perspiration and flatulence was overwhelming to Buddy Bolden. He demanded that the windows be turned open. Willie picked up on that sentiment and the band picked up on Willie's lead. Whereas the fickle hand of fate dealt to Buddy Bolden would see him drift off into an alcohol induced schizophrenia and institutionalized, the song itself -- much like jazz itself -- has been improvised, copyrighted and changed in the century since it was first ad-libbed. There is no consensus as to what the original lyrics are. The lyrics that have been popularized were recorded by Jelly Roll Morton for the Library of Congress in 1938. There is also no proof that the melody was even authored by Bolden. Fellow jazzman Theron Catlan Bennett copyrighted the melody in 1904 for his St. Louis Tickle rag. Buddy Bolden would never enjoy the legacy that was granted to the aforementioned Coltrane, Parker and Davis. But Buddy Bolden lives on today in the most unusual of ways. He has been posthumously preserved as fictional characters in popular novels by David Fulmer, Peter J. Heck and Michael Ondaatje. The world won't let Buddy Bolden drift off into anonymity. We can still hear Buddy Bolden shout. they'll never bring him down. This is the best reply that I could hope for. A Poem for Buddy Bolden!